Sheffield is currently the proud possessor of a rare and unbroken long run of Victorian commercial streetscape on Pinstone Street running all the way from Barkers Pool down to the bottom of Cambridge Street. Sheffield Council has once again proved to the world its Philistine attitude to its heritage. Even Historic England (previously English Heritage) has frowned upon this scheme and their views were as follows; “The demolition of the Athol Hotel and 78-82 Pinstone Street and the height and bulk of the proposed 8 storey new-build will cause harm to the City Centre Conservation Area.” After all they’re only a national body of experts who have made their opinions clear, so let’s just ignore ‘em eh? So well done Sheffield Council. The Luftwaffe would have been proud of you. 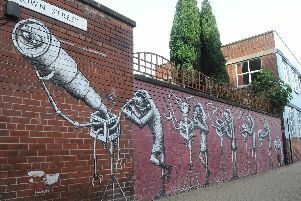 Letters: Now that is vandalism in Sheffield!